Fall of the Berlin Wall 25 years ago: Germany commemorates the wall's demise with 8,000 balloons. 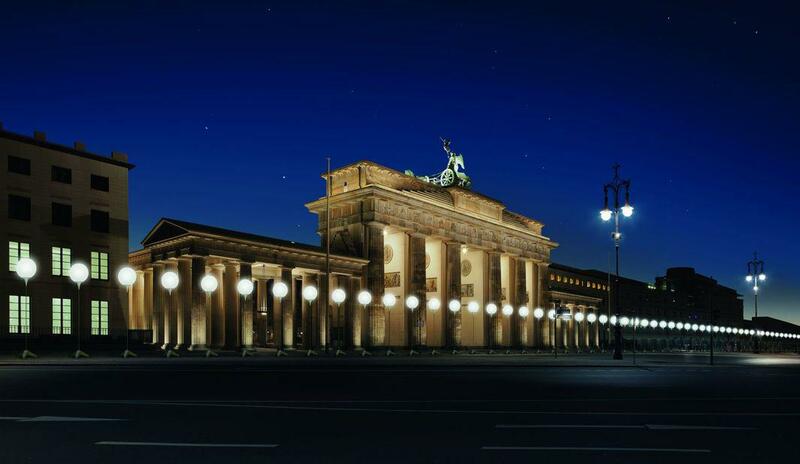 Visualization of the Lichtgrenze at Brandenburg Gate that will take place on Nov. 7–9 to commemorate the 25th anniversary of the fall of the Berlin Wall. Photo by Daniel Büche. Courtesy of Kulturprojekte Berlin_WHITEvoid/ Christopher Bauder. The Berlin Wall fell nearly 25 years ago, and to commemorate that momentous event, Germany has commissioned a poetic art installation to mark the Nov. 9, 1989, anniversary. 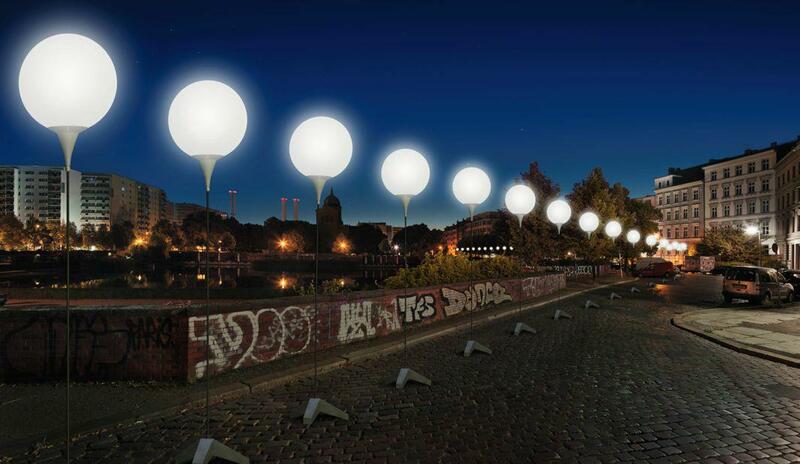 From Nov. 7–9, a 9.5-mile (15.3-kilometer) stretch of what was once the Berlin Wall will be illuminated by 8,000 helium-filled white balloons made of 100 percent biodegradable organic latex. (The art and design studio WHITEvoid, which is producing the installation, focused on using environmentally friendly materials.) The balloons will be attached with special clipping devices on stands that use battery-lit LEDs to illuminate the balloons like ephemeral street lamps. Visualization of the Lichtgrenze at Engelbecken. The 8,000 battery-operated, biodegradable illuminated balloons were produced by art and design studio WHITEvoid. Designed from a concept by brothers Christopher Bauder and Marc Bauder, the Lichtgrenze (Border of Lights) installation will include historic video footage on screens planted in several gathering spaces along the ghostly trail of the former wall and a selection of stories about this painful piece of German history from Berliners who lived through it. 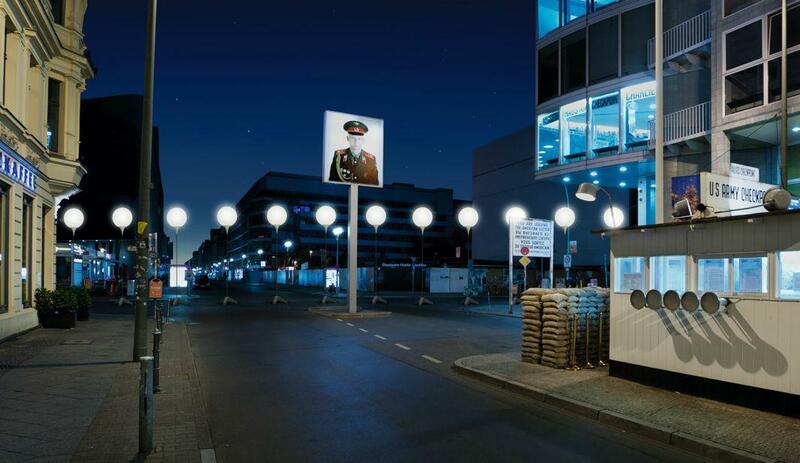 Visualization of the Lichtgrenze at Checkpoint Charlie. Late afternoon on Nov. 9, volunteer balloon patrons will ceremoniously untether the balloons. The video below includes a split-screen depiction that includes a preview of the installation alongside historic video clips of what life looked like before the wall fell.